Jesus is up to something good in each person’s life, in every neighbourhood on earth. And he’s inviting us to join him. Scripture talks a lot about how we treat our neighbours. God invites us to be a kind of people who do justice and practice mercy, who follow Jesus’ command to love our neighbours by looking for opportunities to practically express God’s care. All the world’s people are our neighbours. From God’s perspective our lives are intricately connected and how we choose to live impacts so many others. These are some initiatives in which we participate. Join us as we seek to partner with Jesus in his serving, transforming work around the world. A number of our people have served in northern Haiti and have developed growing friendships in these communities. We continue to partner with the Canadian Covenant family of churches to care for the people of Haiti, the poorest nation in the western hemisphere. In 2012 Dr. Emmanuel Mareus (Dr. Manno, pictured at top, far right) brought several of our people to Petite Anse, a coastal community on the edge of Cap-Haitien, situated on soggy land that has accumulated from garbage being dumped in this mangrove region. College Park members initiated this partnership between Food for the Poor Canada, Cherline Lincifort of Haute Limbe as the ECCC’s agent (pictured at top, centre in blue shirt), Pastor Dugay of Cap Haitien (pictured at top, third from the left) Gleaners and Relive. At this time about 170 children receive a nutritious meal twice per week in their community's church building (pictured above), along with some Christian teaching. We are grateful that, as this program has grown beyond our means, our ECCC family has joined us in supporting the children who live in this difficult environment. A partnership with Dr. Manno and the ECCC. Over 200 diabetics are receiving subsidized care including insulin through this much-needed clinic in Haute Limbe. A partnership with Haute Limbe Baptist Church to provide weekly food supplements and medical treatment for elderly members of Haute Limbe. The medical clinic, in partnership with the local Boy Scouts and the Haute Limbe Baptist Church, has been offering medical care to the people of their community. While our partnership with Ebenezer Clinic is in a transitional season, the ECCC presently assists with the cost of a chaplain and part of their administration. Or visit the ECCC webpage about partnerships in Haiti. A number of our people sponsor children through Compassion International’s project and school, located in Haute Limbe Baptist Church. We participate as virtual farmers in the ECCC’s Kernels of Hope initiative to provide food relief and food security in South Sudan, Liberia and the DR Congo. Currently the Malio Food Security project will seek to improve food production and food consumption for 600 farming families from 8 villages in Beni territory, North Kivu Province in the DR Congo. Here’s how the program works: Canadian Covenant farmers in several provinces donate their time to grow wheat and canola crops on a portion of their land set aside to be “purchased” by virtual farmer donors. Those donations pay the costs of rent, seed, chemicals, insurance, and custom work. When the crops are sold, the Canadian Department of Foreign Affairs, Trade and Development matches the grain sales revenue on a four-to-one ratio to reach the final donation amount. 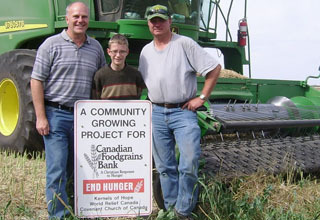 That money is distributed to the intended recipients through the Canadian Food Grains Bank and World Relief Canada. Click here to become a virtual farmer today on the ECCC website! Ray "The Grain Guy" Baloun (pictured above at left) being interviewed remotely on 100 Huntley Street. As a church we sponsor three children through World Vision’s Covenant Kids Congo project, and additional children are sponsored by families in our community. Covenant Kids Congo emerged from the Covenant’s desire to stand with our Congolese brothers and sisters to turn around the most over-looked province in the neediest country of the world. Joining together with World Vision in Equateur, this unprecedented partnership is providing a “journey to transformation,” adding to the spiritual work carried out through the congregations of the Covenant Church of Congo. This proven community development model for sustainable long-term solutions is built on World Vision’s 60 years of experience building a better world for children. The ECC across North America has committed to sponsor 10,000 children. 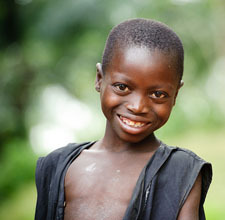 Sponsor a child today on the ECCC website!